Thank you for your recent purchase. We carry only the highest quality pieces from U.S. manufacturers. Although problems are rare, please read and implement the following care tips to preserve and maintain the integrity of your piece. WARRANTY: Statuary and Fountains comes with a 1 year manufactuers warranty against defects in manufacturing and provides for repair or replacement of product only. This warranty is provided by the manufacturer and facilitated through our store soley at the discretion of the manufacturer. Fountain pumps are warranted for one year from date of purchase. In no case shall labor or delivery be covered under this warranty. Labor to repair or replace warranty issues will be billed at the prevailing rate, currently $70/man hour, plus applicable fuel surcharge. DO NOT LET WATER FREEZE IN OR ON YOUR STATUARY. Although all of our statuary is designed to live in the outdoors, pieces that can hold water must be protected during the winter. 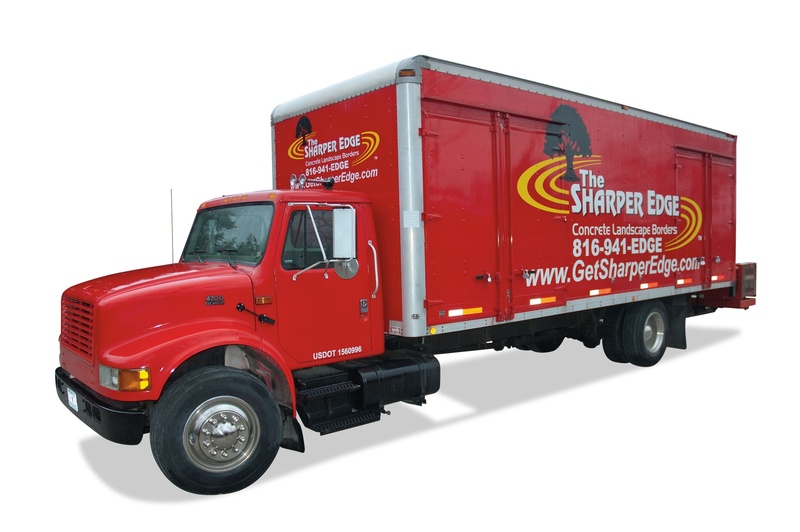 Freeze damage is easily recognizable and is specifically not covered under warranty. 1) During the warm months your fountain must be kept clean. We recommend the use of Fountec for algae control and Protec to minimize scale and lime. Determine how many gallons of water your fountain holds and add the prorated dosage each time water is added to the fountain. Fountec is very effective against algae, however, you may occasionally experience an algae bloom, especially during hot humid conditions. If this happens clean and empty the fountain, refill and add more Fountec. Periodic cleaning of your fountain will be necessary as no algaecide is 100% effective and will not eliminate debris buildup. Utilizing a soft brush, wipe the insides of the fountain and hose out the dirty water. Use of a pressure washer may damage your finish. Some finishes will turn the water green for the first couple of weeks; this is normal and results from the stains used to finish the product. Not algae. 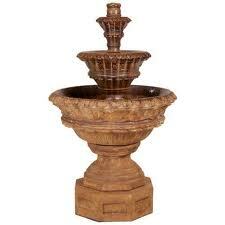 DO NOT USE CHLORINE TABLETS OR BLEACH IN YOUR FOUNTAIN AS IT WILL DAMAMGE AND/OR REMOVE THE FINISH ON THE FOUNTAIN. ADDITIONALLY, THE LIFE OF THE TUBING AND PUMP WILL BE GREATLY SHORTENED WHEN EXPOSED TO CHLORINE. Use of these chemicals dries out the plastic and makes it brittle. Cracked tubing and pumps due to chlorine use will not be warranted. 2) Keep your pump clean and free of debris. If you notice that the volume of water your fountain is producing has greatly reduced, reach in and pull the pump out and clean any algae or debris from the intake of the pump. 3) Periodic re-leveling, especially during the first year, may be required if your ground settles. Failure to maintain a level fountain will result in a fountain that does not run correctly and could lead to the fountain toppling over, damaging the piece and/or the surroundings. 4) Your fountain must have water in it to run correctly and protect the pump and will likely need to be filled throughout the week. Do not run in excessive wind. We specify all of our fountains with mag-drive pumps which are more forgiving. However, the best pump in the world will eventually burn up if allowed to run dry. Use of timers is not recommended unless an auto fill system is installed. Use of an inside switch or remote control is recommended. Turn the fountain on and observe the water level. If needed add more water before running it again. Furthermore, to extend the life of your pump, don’t run your fountain 24/7. Run it only when you are there to enjoy it. 1) Prior to the first freeze of the season your fountain should be completely drained of all water. Many pieces come equipped with an easily removable drain plug. If your piece does not have a plug, a wet/dry shop vacuum, towels, cup or some other measure can be used to empty the piece. 2) If the pump is easily removed you may remove it. The pump may be left in the fountain but must be tilted and drained. Place burlap, old towels or rags in all of the bowls to absorb any condensation which may drip in during the winter months. 3) Cover the fountain with an approved fountain cover sold by our store. Note that an approved fountain cover has the ability to breathe. Trash bags and plastic tarps are known to cause freeze damage as they retain moisture against the piece, are unsightly and not recommended. 4) WARNING: High winds could topple your fountain while covered. Remove small, lighter components at the top of the fountain which could be subject to wind, prior to covering. During periods of extreme wind it is advised to remove the cover to avoid a parachute effect. 5) Birdbaths may be brought inside for the winter, or the top may be flipped over to shed water. 6) Statues with a propensity to hold water must be protected or taken inside to avoid freeze damage. 7) Do not allow your piece to come in contact with de-icing salts. Do not use antifreeze or attempt run a fountain below 33 degrees. Our Cast stone planters and frost proof pottery pieces are designed to live outdoors all year as long as they have proper drainage which does not allow water to build up inside. Most planters have a hole in the bottom to allow water to drain. For a lower risk of freeze damage remove all the dirt from the planter prior to the first freeze and turn upside down. Ensure that the planter is elevated off the dirt or concrete with a riser and that ice cannot pool around the base and plug the hole.